10. Are Nanocarriers Effective for the Diagnosis and Treatment of Pancreatic Cancer? 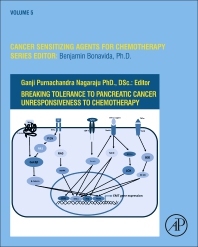 Breaking Tolerance to Pancreatic Cancer Unresponsiveness to Chemotherapy edited by Dr. Nagaraju, PhD., DSc. focuses on overriding the resistance from chemotherapeutic drugs with a broader range of treatment options. It particularly focuses on stroma, tumor microenvironment, stem cells, stellate cells, transcription factors, growth factors, and important signaling pathways. This volume discusses topics such as pancreatic cancer biology, current therapeutic options, EMT, chemotherapy resistance mechanisms, and genetic manipulations and natural products to enhance the sensitivity of pancreatic cancer to chemotherapy. Additionally, it discusses small targeted molecules and pancreatic cancer trials, and nanotechnology-based drug delivery. Breaking Tolerance to Pancreatic Cancer Unresponsiveness to Chemotherapy is a valuable source for researchers and advanced students in cancer and oncology as well as clinicians and medical students who are interested in learning more about ways to break pancreatic cancer resistance to chemotherapy. Dr. Nagaraju has retained an active research laboratory pursuing his own independent interests as well as collaborative projects investigating pancreatic and colon cancers with various researchers at Emory University, Kyung Hee University (South Korea), University of North Texas Health Science Center, JNTU (India) and other leading academic institutions. He conducts bench-based research and pre-clinical trials with the goal of translating biomedical research findings to the bed-side. His research has mainly focused on three areas. The first identifies signalling pathways involved in pancreatic and colon cancer growth and metastasis; he is also studying how Hsp90 and its clients comprising of both oncogenes and tumor suppressors are deregulated in pancreatic and colon cancers. The second area of his investigation focuses on how Hsp90 functional inhibitors, either directly or via modulation of other signal molecules, are involved in the development and progression of colon and pancreatic cancers; regulation of angiogenesis by HIF-1α, a client of Hsp90 and its biological significance has been another major focus in this research. The third area of Dr. Nagaraju’s investigation examines the role of curcumin and its analogues on the inhibition pathways associated with pancreatic and colon cancer progression and metastasis. Dr. Nagaraju has mentored students and residents and published in many peer-reviewed journals in all of his research projects; therefore, he is suitable to be an Editor for this volume.